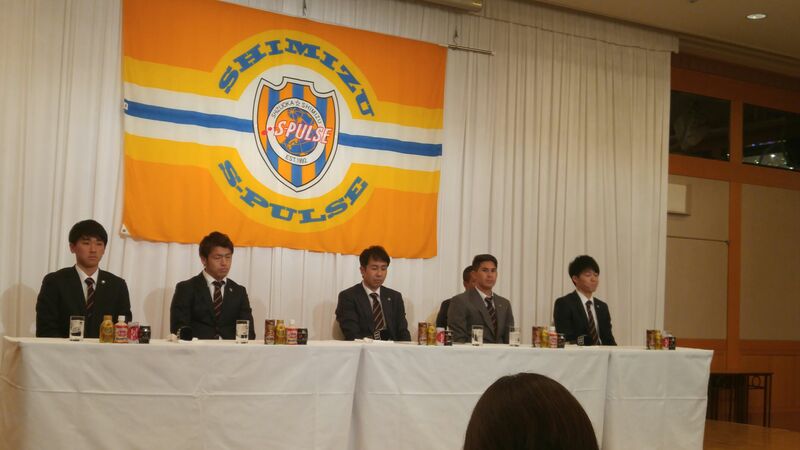 On January 11th the Shimizu S-Pulse 2019 Season New Uniforms, Policy and New Team Members Announcements Meeting took place from 13 p.m. on the 4th floor of the Century Hotel in Shizuoka City! This was again a long-awaited meeting after the remarkable progress in 2018! The new uniforms for home games and away games were unveiled and although slightly different from last year, continued with a more sober and adult design. The main color will be deep yellow and orange for home games and white with a little orange for away games. 2019 and beyond will basically follow the same path with the budget that been upgraded to 38.5 billion yen in 2018, and should aim at 40 billion yen in 2019 and 42 billion yen in 2020. As confirmed before, this is a budget well above the average in the J1 league with sponsorship, general earnings, sales and wages taking the club to the 9th spot in a league accounting for 18 clubs. 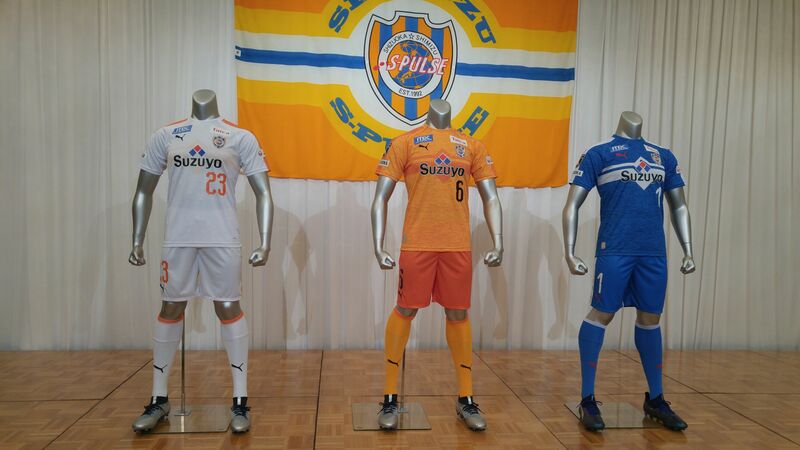 As for future targets they are still the same, that is, Shimizu S-Pulse aims at no less than becoming J1 League Champions within 4 years and ACL Champions within 6 years. Vindicating the new coaching staff put in place in 2108 it has been re-assigned in bloc for a marked continuity in success. As for the playing staff it has been pared down to a more reasonable size with the import of precisely targeted recruits and the confidence renewed in young players according to the club policy to develop as many of their players as possible. All the lines are solidly doubled with an accent on re-enforcing the defense which was only average the past season and the midfield to support a very successful attack. Not only this will ensure a smooth turnover, especially with players on international duty, but also promises fierce competition for the starting spots! DF (right lateral) Elson Ferreira De Souza/nickname, Elsinho (Jersey No 18) acquired from Kawaasaki Frontale. Two new Brazilian players, Wanderson and Augusto and one Chinese player, WU Shaocong are still being processed and will be announced in the near future! Ever-smiling Kazuya Murata, born on October 7th 1988, is a highly popular senior member who has already played for Shimizu S-Pulse since 2013. Born in Moriyama City in Shiga Prefecture he attended Yasu High School, an establishment well-known for its soccer/football club in Shiga Prefecture, and later attended Osaka University of Health and Sports Sciences where among others he was awarded a Physical Education Teaching License. He first joined Cerezo Osaka Soccer Club in 2011 before moving to Shimizu S-Pulse two years later. He is married and has a 3-year old son. Question: What was the main difference for you between your native Shiga prefecture and Shizuoka Prefecture? Kazuya Murata: I can’t say there were huge differences to overcome as both share a welcome “country” atmosphere. I actually feel very comfortable in Shimizu and Shizuoka Prefecture with its nature spread along the sea and deep inland. Although Shiga Prefecture has no sea shore, the big Lake Biwa certainly makes it up as an inland sea! It is certainly a great region to live in a professional sportsman with a family! Q: What about the local food, then? K M: I must admit that not being born near meant I had eaten almost no sushi until I came to Shimizu. I was a big meat eater and it did take a long time before I started enjoying fish and seafood. On the other hand I must admit that coming to Shizuoka contributed to a far better balance in my daily diet! Q: Quite an interesting comment from one who knows a fair bit about health and sports Sciences! What about vegetables, then? K M: (laugh) If it were not for the wife, I would be hopeless. I understand I need them and fortunately my better half concocts food with as much vegetables as possible, cutting them in small pieces and including them in soups, especially minestrone, and curries in particular! K M: I spend as much as time as possible with my young son watching him growing and trying to contribute as much as possible to his education. I keep visiting regularly schools to gain as much experience as possible for when I retire from soccer and becomes the teacher according to my studies at university. Q: What do you usually drink with your food? K M: as I can’t drink any alcohol, I consume green tea, sports drinks, although the latter might not be that healthy (laugh)! Q: Would you like to recommend a restaurant to our fans and readers? K M: We mentioned in our private conversation prior to this interview a great Osaka-style Takoyaki restaurant called Ebisu in Aoi Ku, Shizuoka City whose owner has become a personal friend. Another fine place, inexpensive with nice food and cozy atmosphere, is Onion in Shimizu Ku! Thinking of the name, I feel less guilty for not eating enough vegetables! A young man with an ambition! 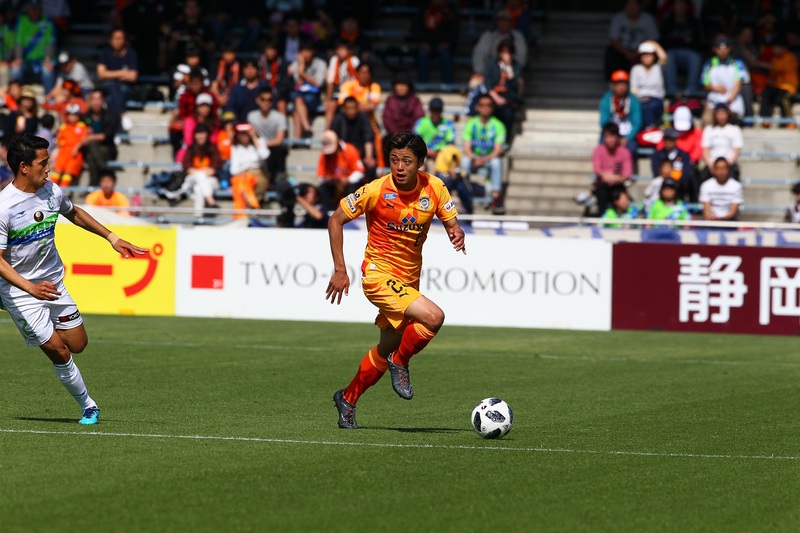 Ko Matsubara, born on August 30th 1996, is still a very young (almost 22 years of age) Shimizu S-Pulse player but is already an established member/senior member who has started in most matches so far this year. He is also a Shizuoka prefecture home-grown player who was playing for the Jubilo JR Iwata Youth team when attending Hamamatsu Kaiseikan High School in Hamamatsu City. He first appeared for Shimizu S-Pulse in 2015 and has already been selected 3 times for the J League Under-22. Originally an attacker, he is very versatile player who converted to a dangerous attacking left back constantly taking part in counters apart of being a very effective defender. Question: Ko, would you care describing yourself? -Ko Matsubara: I am still young and not very talkative. I still have to learn before expressing myself at ease. One thing is sure: I do not like to lose and may have to control my temper on the pitch. Off the pitch I concentrate on my interests and am a quiet person. Q: How often do you go back to your birthplace in Hamamatsu and do you still visit your schools? K M: I do go back home when on holidays, which means basically only during the off season. I do pay a visit at least once a year to my schools to keep the links with my youth and help out. Q: What are your hobbies apart of soccer/football? K M: Computer games, definitely. I play them on my smart phone and easily get lost into them. Recently, after an acquaintance offered me some, I taken a liking to reading books. Being a professional sportsman I do have to take a lot of rest in between exercise, games and physical care, so these hobbies are easy to enjoy. Q: What fashion do you follow? K M: Formal or casual, depending on the occasion. I prefer slacks and shirts of the latest fashion. I must admit I do spend quite a big amount of money on clothes as I enjoy being well-dressed. You could say this is another one of my hobbies! Q: What food do you particularly enjoy? K M: Sushi and seafood, especially raw seafood! I am always on a look out for a new restaurant, so I would be grateful if you could introduce me to one! Because I have to take care of my physical condition I have started to appreciate vegetables. I have recently developed a special liking for broccoli! Q: What is your ambition as a soccer/football player? K M: As high and as far as possible! I know I still have my future ahead of me, but I would like very much to play abroad although that might imply quite an amount of dedication and learning. Naturally, my dream would be to play for the National Japan Eleven! Q: Dear Ko, thank you so much for sparing your time and I wish you all the best! And who knows, I might have to interview you for a bigger reason one day! K M: You are most welcome!